Stradella was murdered in Genoa when he was forty-two years old. Until then he enjoyed a dazzling career as a freelance composer, writing on commission, collaborating with distinguished poets, producing over three hundred works in a variety of genres. His musical style is distinctive, characterized by fluid lines, great skill in counterpoint, and harmony which was tonal but which occasionally offers chords that were unusual then and striking even today. The oratorio San Giovanni Battista was written for performance on Palm Sunday in the Holy Year of 1675 where some fourteen oratorios were commissioned by the confraternity of the church of San Giovanni dei Fiorentini in Rome—an auspicious event. San Giovanni Battista is a deeply ‘Baroque’ score, vibrant, rhythmically insistent, requiring singers to perform phrases of difficult fiorituras or deeply moving legato lines. The libretto is dramatic and emotionally vivid, and the music is closely tied to the text, creating a distinctly operatic atmosphere—described by the disc’s conductor Alessandro De Marchi as ‘a true Salome’. Hyperion is delighted to announce a new recording relationship with Academia Montis Regalis, of which this disc is the first fruit. The group’s previous recordings on French label Opus 111 have won many international awards. The Academia Montis Regalis Foundation started its courses in Baroque and Classical orchestral training in the town of Mondovì in 1994. The aim was to offer young Italian and foreign musicians interested in the seventeenth- and eighteenth-century repertoire the opportunity to engage in a unique experience. Thus was born the Academia Montis Regalis, a period instrument orchestra that has been regularly directed by leading international early music specialists since the year of its foundation, including Ton Koopman, Jordi Savall, Christopher Hogwood, Reinhardt Goebel and many others. The principal director has for some years been Alessandro De Marchi, who has overseen an important project with the Academia Montis Regalis, recording all of Vivaldi’s manuscripts preserved in the National Library of Turin. Right from the start the training programme was accompanied by highly successful concert performances. Today the orchestra is a professional ensemble with a solid international reputation. Alessandro Stradella was murdered in Genoa on 25 February 1682 when he was forty-two years old. Some years later, in 1715, the first history of music in French, written by Pierre Bourdelot and his nephew Pierre Bonnet-Bourdelot, carried a brief account of the murder and the events leading up to it. Although almost wholly false, its invented tale of a first attempt to kill the composer being thwarted because the hired thugs were so moved by the beauty of Stradella’s music heard in a concert, as well as other exciting although fanciful moments dreamed up by the two Frenchmen, captured the imagination of even serious music historians, who continually repeated the story. Moreover, it was embellished by writers in opera librettos and novels for the following three centuries. It was only in 1994 that the first documentary monograph of his life and music appeared and the ‘Stradella legend’ was finally put to rest. It is now known that Stradella was born in the city of Nepi (near Viterbo) on 3 April 1639. His family was a noble one and, even though they were not titled, included doctors, lawyers and clergymen (one of whom became a bishop). It is possible that as a boy Alessandro studied music in Bologna; what is certain is that in 1653 he became a page to the ducal Lante family and lived in their palace in Rome until 1661. These would have been years of intellectual enrichment, of musical education, and of profitable contacts with the many nobles who frequented the Lante. The first notice of Stradella as a composer comes from 1667 when he was commissioned to write an oratorio (now lost) for the prestigious Arciconfraternita del Santissimo Crocifisso, the society of nobles who financed the oratory of the church of San Marcello. From then on until his death, Stradella maintained his independence as a freelance musician, composing on commission for families such as the Pamphili, the Colonna, the Altieri and others. He was also amazingly productive. His more than three-hundred compositions cover all the genres of the period: operas; oratorios; secular, sacred and moral cantatas; prologues and intermezzos; motets and madrigals; incidental music for a spoken play; sonatas for one or two solo instruments, as well as for concertino– concerto grosso instrumentation. Stradella’s versatility was coupled with an ease and rapidity of composing, evident from his autograph manuscripts where his pen seems to fly on the page and cancellations are rare. His musical style is distinctive, characterized by fluid lines, great skill in counterpoint, and harmony which was tonal but which occasionally offers chords that were unusual then and striking even today. It must be noted that Stradella’s vocal music is very closely tied to its text, both formally and stylistically. This extends also to his recitatives where, in order to heighten certain words and phrases, fiorituras and ariosos are not uncommon, nor are instrumental interjections and continual instrumental accompaniment. Stradella was thus one of the earliest composers to compose accompanied recitative. He also composed the first datable work scored for concerto grosso instrumentation (1674), as well as one of the earliest comic operas (1679). He composed mad scenes in two of his operas (1678 and 1679), still a novelty at the time, probably writing the text for two of the 1678 mad scenes himself. And the prose comedy for which he wrote both serious and comic arias and duets results in what is a rare and complete example of a work of commedia dell’arte. While a ‘Stradella legend’ grew based on false and exaggerated accounts of his life, the details of Stradella’s real existence were also exciting. In 1676 he and a friend managed to arrange a marriage between a supposedly ‘ugly and old’ woman and the nephew of the Secretary of State of the Vatican, Cardinal Cibo, receiving a large sum of money from the happy bride. Naturally the cardinal was not pleased and, when he annulled the marriage and put the woman in a convent, Stradella feared that his anger would turn to him, too, so at the age of thirty-eight he wisely left Rome for Venice. Here he was aided by the nobleman Polo Michiel, already a patron, and began to teach music to Agnese Van Uffele, a young woman protected by the aristocrat Alvise Contarini. After only a few months, the two fled to Turin, where Stradella hoped that the court might need his services. Although Stradella later said that the girl had begged him to take her away, Contarini insisted they marry. When all was finally arranged, two thugs Contarini had hired beat the composer so thoroughly he almost died. Fortunately Stradella was able to move on in December 1677 to Genoa, this time alone. He was greeted warmly by Duke Giovanni Andrea Doria and his wife Anna Pamphili, who did all they could to keep him in the city. In fact, a group of nobles contracted to give him a house, food, a servant and 100 doubloons a year, for which he was not obliged to do anything except remain in the city for at least two or three years. While in Genoa he composed operas for the Teatro Falcone, music for the nobility for their private parties and their churches, as well as works requested of him from elsewhere. It is notable that, in spite of his somewhat erratic life, Stradella never lost a friend or patron because of his behaviour: this says much about the personal respect with which he was held, and of course about the great esteem accorded to his music. Stradella’s good fortune was not to last, however, and on 25 February 1682—for reasons that are still unclear—an assasin thrust a dagger into his back three times and killed him instantly. He was buried in one of the most aristocratic churches of Genoa, Santa Maria delle Vigne, an enormous number of candles were lit for him, and twenty-four masses were to be said for his soul. Stradella’s music manuscripts found their way mainly into the library of Duke Francesco d’Este of Modena, now housed in the Biblioteca Estense Universitaria of Modena, and into the Biblioteca Nazionale Universitaria of Turin in the Mauro Foà and Renzo Giordano collections. Handel owned several of Stradella’s manuscripts, including a copy of the oratorio San Giovanni Battista, and both Charles Burney and Padre Martini wrote in praise of his compositional skill, citing in detail pieces from this oratorio. 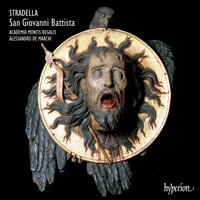 Stradella himself considered San Giovanni Battista to be his best work to that date. In 1675 the confraternity of the church of San Giovanni dei Fiorentini in Rome, which met in the Oratorio della Pietà, decided to offer a series of fourteen oratorios to be performed between January and April of that year. The series was prompted by the fact that it was a Holy Year and the composers chosen were among Rome’s best. Stradella was commissioned to set what was certainly the most important of the librettos, one about Saint John the Baptist, patron saint of Florence and of Florentines and to whom their church in Rome was dedicated. It was performed on Palm Sunday, 31 March 1675, a prime position on the liturgical calendar. The author of the libretto was Ansaldo Ansaldi, born in Florence in 1651 to a noble family. He had studied first under the Jesuits in Florence and then at the University of Pisa. To continue his studies in law he moved to Rome, where he had an illustrious ecclesiastical career. His literary ability was also acclaimed and he was made a member of the Accademia Fiorentina and of Arcadia. Ansaldi died in 1719 and was buried in San Giovanni dei Fiorentini, affirming his close connection to the confraternity and their esteem for him. Coupling Stradella with such a noteworthy ecclesiastical and literary figure makes it clear that they valued the composer, too. Ansaldi’s libretto presents the usual New Testament story (reported in Mark 6: 17–21) of John the Baptist (Giovanni Battista) who goes to the court of Herod (Herode) to try to convince him to send away the wife (Herodiade la Madre, or just Herodiade) of his brother whom he has taken for his own, and to renounce worldly pleasures and his lascivious life. Naturally Herodiade and her daughter Herodiade la Figlia (also known as Salome) are not ready to give up their comfortable life and they manage to convince Herode to send Giovanni to prison. But when Herode offers to give Salome whatever she asks, in gratitude for having danced so exotically for him at the festivities for his birthday, her mother suggests that she ask for Giovanni’s head, which she does. At the end of the libretto, Herode is in doubt as to whether he did the right thing, whereas Salome is delighted he killed Giovanni. To these characters, Ansaldi added a court counsellor (Consigliere). Stradella scored the oratorio for two sopranos (Salome and Herodiade), a contralto or countertenor (Giovanni), a tenor (Consigliere) and a bass (Herode). These same voices join together to take the roles of Giovanni’s disciples and Herode’s courtiers. The names of the original singers are known and they were among the best Rome had to offer. To accompany the whole 1675 series of oratorios there were ten (unspecified) instrumentalists, to which ten more were added for Stradella’s contribution. Among these latter there was a harpsichordist, a lutenist, two violinists, two violists and two double bass players. From what one can glean from documents and from Stradella’s score (his is the only oratorio of the series to survive), the instruments were divided into a concertino and a concerto grosso. Probably the concertino comprised two violins, the lute and perhaps one of the double basses, while the concerto grosso seems to have had six violins, four first violas, four second violas, four cellos and a double bass. The harpsichord could have been used as continuo for both groups, although it is called for only in the concertino; and an organ, although not specified, could well have been employed. Stradella achieves great variety and sense of movement in the oratorio (traditionally unstaged) by changing the scoring from piece to piece. Of the thirteen arias in San Giovanni Battista, six are accompanied only by continuo and six by other instruments as well. Of these, one is accompanied by only the concertino (‘Io per me non cangerei’), two by only concerto grosso (‘Sorde dive’ and ‘Vaghe ninfe del giordano’), one has the concerto grosso during its first section and the concertino during its second section (‘Tuonerà tra mille turbini’), and one aria employs both concertino and concerto grosso for its accompaniment (‘Soffin pur, rabbiosi fremiti’). The instruments are still further rearranged for the accompaniment of two other arias: ‘Queste lagrime e sospiri’ is the aria Salome sings to urge Herode to decapitate Giovanni and here the instruments form a single ensemble of two violin parts, a viola part and two separate continuos (one assigned to the voice). In ‘Provi pur le mie vendette’ Herode gives his answer to the girl and, once again, the voice has a separate continuo, while the other instruments are divided now into two violin parts, two viola parts and basso continuo. Ansaldi’s text is very dramatic and moving, and Stradella seconds the development of the plot, reinforcing most notably—for example in ‘Queste lagrime’ and its introductory recitative beginning ‘Deh, che più tardi a consolar’—the horror of the daughter’s request for Giovanni’s head; his music reveals all her coaxing as she flatters Herode, her pleading for pity since she suffers just to see or to hear Giovanni, and, finally, exposes her violent need to have him executed. In ‘Tuonerà tra mille turbini’ Herode is first presented as a powerful king, one whose anger at Giovanni causes him to ‘thunder’ at him and banish him to a dark cell. But at the thought of having Giovanni decapitated, his weakness, uncertainty and fear for what he has to do are portrayed in the duet with Salome ‘Nel seren de’ miei / tuoi contenti’, and are also suggested in the unresolved chord closing the oratorio. And the marvellous virtuosic duet for the daughter and Giovanni, ‘Morirai! Uccidetelo / Uccidetemi pur!’ enables him to state his willingness to die and her, simultaneously, to gloat with satisfaction at his fate. San Giovanni Battista is a most ‘Baroque’ score, vibrant, rhythmically insistent, requiring singers to perform phrases of difficult fiorituras or deeply moving legato lines, a score in Stradella’s best contrapuntal manner whether for voices and / or instruments (such as the well-developed opening Sinfonia in three brief movements). Handel, Burney and Martini were right to admire it. Alessandro Stradella fut assassiné à Gênes le 25 février 1682—il avait quarante-deux ans. Plus tard, en 1715, Pierre Bourdelot et son neveu Pierre Bonnet-Bourdelot, rédigeant la première histoire de la musique en langue française, relatèrent brièvement ce meurtre et les événements qui y conduisirent. Bien que presque entièrement faux, leur récit d’une première tentative d’assassinat avortée—les spadassins auraient renoncé, émus par la beauté de la musique de Stradella entendue lors d’un concert—ravit l’imagination des musicographes, même sérieux, qui ne cessèrent de colporter cette histoire inventée par les deux Français, également à l’origine d’autres moments passionnants mais fantaisistes. Trois siècles durant, librettistes et romanciers enjolivèrent ce récit et il fallut attendre 1994 pour que la première monographie documentaire de la vie et de la musique de Stradella dissipât enfin cette «légende». Stradella naquit dans la cité de Nepi (près de Viterbo) le 3 avril 1639, dans une famille noble non titrée, où l’on trouvait cependant des médecins, des hommes de loi et des ecclésiastiques (dont un évêque). Peut-être le jeune Alessandro étudia-t-il la musique à Bologne; mais une chose est sûre: en 1653, il devint page de la famille ducale Lante, qui l’hébergea dans son palais romain jusqu’en 1661. Ce furent des années d’enrichissement intellectuel et de formation musicale au cours desquelles il noua de fructueux contacts avec les nombreux nobles qui fréquentaient les Lante. La première trace de notre compositeur remonte à 1667, quand il se vit commander un oratorio (aujourd’hui perdu) pour la prestigieuse Arciconfraternita del Santissimo Crocifisso, la société nobiliaire qui finançait l’oratoire de l’église San Marcello. De cet instant jusqu’à sa mort, Stradella demeura un musicien indépendant, composant sur commande pour des familles comme les Pamphili, les Colonna, les Altieri et autres. Il fut d’ailleurs étonnamment productif, avec plus de trois cents œuvres couvrant tous les genres de l’époque: opéras; oratorios; cantates profanes, sacrées et morales; prologues et intermezzos; motets et madrigaux; musique de scène pour une pièce parlée; sonate pour un ou deux instruments solo, mais aussi pour concertino/concerto grosso. À cette polyvalence s’ajoutaient une facilité et une rapidité de composition, comme l’attestent les manuscrits autographes de Stradella, rarement biffés, où la plume semble filer sur la page. Le style de ce compositeur se caractérise par des lignes fluides, par une grande maîtrise du contrepoint et par une harmonie qui, pour être tonale, offre parfois des accords inhabituels pour l’époque—et toujours saisissants aujourd’hui. Notons que, chez Stradella, la musique vocale présente de très étroits liens formels et stylistiques avec le texte—une remarque qui vaut aussi pour ses récitatifs où, pour rehausser certains mots et certaines phrases, fioritures et ariosos, interjections instrumentales et accompagnement instrumental continu sont monnaie courante. Stradella fut ainsi l’un des tout premiers à composer un récitatif accompagné. Il signa également la première œuvre datable pour concerto grosso (1674), ainsi qu’un des tout premiers opéras comiques (1679). Il introduisit aussi des scènes de la folie—encore une nouveauté à l’époque—dans deux de ses opéras, l’un de 1678 (pour lequel il écrivit probablement le texte de deux de ces scènes), l’autre de 1679. Quant à la comédie en prose pour laquelle il composa des arias et des duos sérieux et comiques, elle demeure l’une des rares œuvres de la commedia dell’arte à nous être parvenues en entier. Si la «légende Stradella» prit corps sur des récits faux et exagérés, la vraie vie de ce compositeur ne manqua pas d’être palpitante. En 1676, il parvint, aidé d’un ami, à arranger le mariage d’une femme «vilaine et vieille» avec le neveu du secrétaire d’État du Vatican, le cardinal Cibo, moyennant une jolie somme de la part de l’heureuse future mariée. Naturellement, le cardinal fut tout sauf ravi: il annula le mariage et plaça la dame dans un couvent. Craignant alors que le prélat dirigeât sa colère contre lui, Stradella quitta sagement Rome pour Venise—il avait trente-huit ans. À Venise, il reçut l’aide de Polo Michiel, noble déjà mécène, et commença d’enseigner la musique à Agnese van Uffele, jeune protégée de l’aristocrate Alvise Contarini. Mais, au bout de quelques mois, il s’enfuit avec son élève à Turin où, espérait-il, la cour aurait peut-être besoin de ses services. Il eut beau clamer par la suite que la jeune fille l’avait supplié de l’emmener, Contarini insista pour qu’un mariage eût lieu. Et quand tout fut enfin arrangé, il engagea deux brutes qui battirent le compositeur si durement qu’il faillit en mourir. Par bonheur, il put gagner Gênes (décembre 1677), seul cette fois. Le duc Giovanni Andrea Doria et son épouse Anna Pamphili l’accueillirent chaleureusement et firent tout leur possible pour le garder à Gênes. En fait, un groupe de nobles s’engagea par contrat à lui fournir une maison, à manger, un domestique et cent doublons annuels, pour peu qu’il passât deux ou trois ans dans la cité. Là, il composa des opéras pour le Teatro Falcone, de la musique pour les fêtes privées et les églises de la noblesse, tout en honorant des commandes non génoises. Soulignons que, malgré cette vie un rien mouvementée, Stradella ne perdit ni ami, ni mécène: voilà qui dit bien tout le respect qu’on lui témoignait et la haute estime en laquelle on tenait sa musique. La bonne fortune de Stradella ne devait toutefois pas durer et, le 25 février 1682—pour des raisons encore obscures—, un assassin le poignarda à trois reprises dans le dos, le tuant sur le coup. Il fut inhumé dans l’une des églises les plus aristocratiques de Gênes, Santa Maria delle Vigne; on alluma de très nombreux cierges pour lui et vingt-quatre messes furent dites pour son âme. Les manuscrits musicaux de Stradella appartiennent presque tous à la bibliothèque du duc Francesco d’Este (Modène), désormais conservée à la Biblioteca Estense Universitaria de Modène et à la Biblioteca Nazionale Universitaria de Turin (collections Mauro Foà et Renzo Giordano). Haendel en détint plusieurs, dont un exemplaire de l’oratorio San Giovanni Battista, que Stradella lui-même tenait pour sa meilleure œuvre—pour appuyer leur éloge de l’art compositionnel de ce musicien, Charles Burney et le Padre Martini en citèrent d’ailleurs plusieurs passages en détails. En 1675, la confraternité de l’église San Giovanni dei Fiorentini de Rome, qui se réunissait dans l’Oratorio della Pietà, décida d’offrir quatorze oratorios à jouer entre janvier et avril et, année sainte oblige, choisit parmi les meilleurs compositeurs de la ville. Stradella se vit confier la mise en musique de ce qui était certainement le livret le plus important, celui sur saint Jean-Baptiste, saint patron de Florence et des Florentins, dédicataire de l’église romaine de la confraternité. L’œuvre fut jouée le dimanche des Rameaux (31 mars 1675), une des grandes dates du calendrier liturgique. Ansaldo Ansaldi, le librettiste, naquit à Florence en 1651 dans une famille noble. Après avoir étudié sur place, chez les Jésuites, puis à l’Université de Pise, il alla parfaire son droit à Rome, où il mena une brillante carrière ecclésiastique. Egalement salué pour ses talents littéraires, il fut élu à l’Accademia fiorentina et à l’Académie des Arcades. Il mourut en 1719 et son inhumation à San Giovanni dei Fiorentini scella l’étroit rapport qu’il entretenait avec la confraternité et l’estime que cette dernière lui portait. Que Stradella fût associé à une si remarquable figure ecclésiastique et littéraire montre combien il était, lui aussi, prisé. Le livret d’Ansaldi reprend l’histoire du Nouveau Testament (Marc, 6: 17–21), celle de Jean-Baptiste (Giovanni Battista) se rendant à la cour d’Hérode pour tenter de le convaincre de renvoyer la femme de son frère (Herodiade la Madre, ou Hérodiade), qu’il a faite sienne, et de renoncer aux plaisirs de ce monde, à sa vie lascive. Bien sûr, Herodiade et sa fille Herodiade la Figlia (appelée aussi Salomé) ne sont pas prêtes à abandonner leur vie de confort et parviennent à convaincre Hérode de jeter Giovanni en prison. Puis Hérode, pour remercier Salomé d’avoir exécuté une danse si exotique pendant sa fête d’anniversaire, offre de lui donner tout ce qu’elle voudra: sur la suggestion de sa mère, la jeune fille demande alors la tête de Giovanni. À la fin du livret, Hérode s’interroge sur la justesse de son acte, tandis que Salomé se réjouit qu’il ait tué Giovanni. Ansaldi ayant ajouté un personnage de conseiller à la cour (Consigliere), Stradella composa un oratorio pour deux sopranos (Salomé et Hérodiade), un contralto ou haute-contre (Giovanni), un ténor (Consigliere) et une basse (Hérode). Ces voix assument en chœur les rôles des disciples de Giovanni et des courtisans d’Hérode. Les noms des chanteurs nous sont connus et ils comptaient parmi les meilleurs de Rome. Dix instrumentistes (non spécifiés) devaient accompagner les oratorios, plus dix autres pour celui de Stradella—dont un claveciniste, un luthiste, deux violonistes, deux altistes et deux contrebassistes. D’après les informations glanées dans les documents et dans la partition de Stradella (son oratorio est le seul de la série à nous avoir été conservé), les instruments étaient scindés en concertino/concerto grosso. Le concertino comprenait vraisemblablement deux violons, le luth, voire une des contrebasses, le concerto grosso réunissant, semble-t-il, six violons, quatre premiers altos, quatre seconds altos, quatre violoncelles et une contrebasse. Bien que requis dans le seul concertino, le clavecin pouvait réaliser le continuo pour les deux groupes; un orgue put également être utilisé, même s’il n’est pas mentionné. Stradella insuffle une grande variété et un sens du mouvement à son oratorio (traditionnellement non mis en scène) en modifiant l’instrumentation d’un morceau à l’autre. Sur les treize arias de San Giovanni Battista, six sont accompagnées du seul continuo et six le sont aussi par d’autres instruments. Sur ces six dernières, une est accompagnée par le seul concertino («Io per me non cangerei»), deux par le seul concerto grosso («Sorde dive» et «Vaghe ninfe del giordano»), une autre a le concerto grosso dans sa première section et le concertino dans sa seconde («Tuonerà tra mille turbini»), tandis qu’une autre encore voit son accompagnement assuré et par le concertino et par le concerto grosso («Soffin pur, rabbiosi fremiti»). Les instruments sont réagencés pour l’accompagnement de deux autres arias. «Queste lagrime e sospiri», l’aria chantée par Salomé pour pousser Hérode à décapiter Giovanni, présente les instruments en un unique ensemble ainsi constitué: deux parties de violon, une partie d’alto et deux continuos distincts (dont l’un assigné à la voix). Dans «Provi pur le mie vendette», Hérode donne sa réponse à la jeune fille et, là encore, la voix a son propre continuo, tandis que les instruments sont divisés comme suit: deux parties de violon, deux parties d’alto et basso continuo. Le texte d’Ansaldi est fort dramatique, émouvant, et Stradella appuie le développement de l’intrigue en renforçant très notablement l’horreur de la requête formulée par la jeune fille (ainsi dans «Queste lagrime» et dans son récitatif introductif «Deh, che più tardi a consolar»); les notes disent toute la cajolerie de la jeune Salomé flattant Hérode, tout l’appel à la pitié de celle qui souffre rien qu’à voir et à entendre Giovanni; pour finir, elles disent le violent besoin qu’éprouve cette jeune fille de faire exécuter Giovanni. Dans «Tuonerà tra mille turbini», Hérode est d’abord présenté comme un roi puissant qui tonitrue de colère envers Giovanni avant de la bannir dans une sombre cellule. Mais une fois Giovanni décapité, la faiblesse de ce roi, ses incertitudes et la crainte que lui inspire son geste sont dépeintes dans le duo avec Salomé «Nel seren de’ miei/tuoi contenti» et suggérées dans l’accord non résolu qui clôt l’oratorio. Et le merveilleux duo virtuose entre Giovanni et la jeune fille «Morirai! Uccidetelo/Uccidetemi pur!» permet à lui d’énoncer sa volonté de mourir et à elle de se réjouir, simultanément, de son sort à lui. San Giovanni Battista est une partition des plus «baroques», vibrante, au rythme insistant, qui demande aux chanteurs d’exécuter tantôt des phrases aux fioritures difficiles, tantôt des lignes legato profondément émouvantes—une partition dans la meilleure veine contrapuntique de Stradella, que ce soit pour les voix et/ou les instruments (ainsi la sinfonia d’ouverture bien développée, en trois brefs mouvements). Haendel, Burney et Martini avaient bien raison de l’admirer. Alessandro Stradella wurde am 25. Februar 1682 im Alter von 42 Jahren ermordet. Einige Jahre später, enthielt die erste Musikgeschichte auf Französisch von 1715, die von Pierre Bourdelot und seinem Neffen Pierre Bonnet-Bourdelot geschrieben wurde, eine kurze Schilderung seines Mordes und der Ereignisse, die dazu führten. Obwohl fast völlig falsch, faszinierte diese erfundene Geschichte eines ersten Mordversuchs, der fehlschlug, weil die gedungenen Schläger in einem Konzert so von der Schönheit von Stradellas Musik bewegt waren, und andere aufregende und phantastische Momente, die die beiden Franzosen sich ausdachten, selbst seriöse Musikhistoriker, die die Geschichte stetig weiter verbreiteten. Außerdem wurde sie im Lauf der nächsten drei Jahrhunderte von Schriftstellern in Opernlibretti und Romanen weiter ausgeschmückt. Erst 1994 erschien die erste dokumentarische Monographie über sein Lebens und seine Musik und die „Stradella-Legende“ wurde endlich begraben. Heute wissen wir, dass Stradella am 3. April 1639 in der Stadt Nepi (in der Nähe von Viterbo) geboren wurde. Seine Familie waren Edelleute, und auch wenn sie keinen Titel führten, gehörten ihr Doktoren, Juristen und Kleriker (einschließlich eines Bischofs) an. Es ist möglich, dass Alessandro als Knabe in Bologna Musik studierte, und es steht fest, dass er ein Page der herzöglichen Lante-Familie war und bis 1661 in ihrem Palast in Rom lebte. Dies waren bestimmt Jahre voll intellektueller Bereicherung, musikalischer Erziehung und profitabler Kontakte mit den vielen Adligen, die die Lantes besuchten. Die erste Erwähnung Stradellas als Komponist stammt von 1667, als er den Auftrag erhielt, ein (heute verschollenes) Oratorium für die renommierte Arciconfraternita del Santissimo Crocifisso zu schreiben, die Gesellschaft Adliger, die die Betkapelle in der San Marcello-Kirche finanzierte. Von da an bis zu seinem Tode behielt Stradella seine Unabhängigkeit als freischaffender Musiker, der Kompositionsaufträge für Familien wie die Pamphili, die Colonna, die Altieri und andere erfüllte. Er war erstaunlich produktiv. Seine über dreihundert Kompositionen umfassen alle Genres seiner Zeit: Opern; Oratorien; weltliche, geistliche und moralische Kantaten; Prologe und Intermezzi; Motetten und Madrigale; Bühnenmusik für Schauspiele; Sonaten für ein oder zwei Soloinstrumente oder für Concertino/Concerto Grosso instrumentiert. Stradella war nicht nur vielseitig, er komponierte auch leicht und schnell, was sich aus seinen autographen Handschriften ersehen lässt, wo seine Feder über die Seiten zu fliegen scheint und selten etwas ausgestrichen wird. Sein Musikstil ist unverkennbar und zeichnet sich durch flüssige Linien, großes kontrapunktisches Geschick und damals ungewöhnliche Harmonien aus, die selbst heute noch erstaunlich klingen. Man muss erwähnen, dass Stradellas Vokalmusik sowohl formal als auch stilistisch sehr eng mit ihrem Text verwoben ist. Dies erstreckt sich auch auf die Rezitative, wo Koloraturen und Ariosi nicht ungewöhnlich sind, um gewisse Worte und Phrasen hervorzuheben, oder auch instrumentale Einschübe oder durchgehende Instrumentalbegleitung enthalten. Stradella war also einer der ersten Komponisten, die begleitete Rezitative schrieben. Er komponierte auch das erste datierbare Werk für eine Concerto Grosso-Besetzung (1674), sowie die frühesten komischen Opern (1679). In zwei seiner Opern komponierte er Wahnsinnsszenen (1678 und 1679), damals noch eine Neuheit, und schrieb den Text für zwei der Wahnsinnsszenen von 1678 wahrscheinlich selbst. Und die Prosakomödie, für die er sowohl seriöse als auch komische Arien und Duette schrieb, hatte ein seltenes vollständiges Werk der Commedia dell’arte zum Resultat. Obwohl die „Stradella-Legende“ aus falschen und übertriebenen Schilderungen von Ereignissen in seinem Leben erwuchs, waren auch die Details seines wahren Daseins aufregend. 1676 gelang es ihm und einem Freund, eine Heirat zwischen einer angeblich „hässlichen alten“ Frau und dem Neffen des Staatsekretärs des Vatikans, Kardinal Cibo zu arrangieren, wofür sie von der glücklichen Braut eine beträchtliche Summe erhielten. Der Kardinal war natürlich wenig begeistert, und als er die Heirat annullierte und die Frau in ein Konvent schickte, fürchtete Stradella, dass sein Ärger sich auch bald gegen ihn wenden würde, und traf den weisen Entschluss, Rom zu verlassen und nach Venedig zu gehen. Hier half ihm der adlige Mäzen Polo Michiel, und Stradella begann Agnese Van Uffele, einer jungen Frau unter der Schirmherrschaft des Aristokraten Alvise Contarini, Musikunterricht zu geben. Nach nur einigen Monaten flohen die beiden nach Turin, wo Stradella hoffte, dass der Hof seine Dienste benötigen könnte. Obwohl Stradella später behauptete, dass das Fräulein ihn gebeten hatte, sie mitzunehmen, bestand Contarini auf einer Hochzeit. Als alles schließlich arrangiert war, prügelten zwei von Contarini angeheuerte Schläger Stradella fast zu Tode. Glücklicherweise konnte Stradella im Dezember 1677 nach Genoa gehen, diesmal allein. Er wurde von Herzog Giovanni Andrea Doria und seiner Frau Anna Pamphili herzlich willkommen geheißen, die alles in ihrer Macht taten, um ihn in der Stadt zu behalten. Eine Gruppe Adliger verpflichtete sich sogar, ihm ein Haus, Nahrung, einen Diener und Hundert Dublonen im Jahr zu geben, unter der einzigen Bedingung, dass er mindestens zwei bis drei Jahre in der Stadt blieb. In Genoa komponierte er Opern für das Teatro Falcone, Musik für die Aristokratie für ihre privaten Gesellschaften und ihre Kirchen sowie sonstige Werke, die bei ihm bestellt wurden. Es ist bemerkenswert, dass Stradella trotz seines unsteten Lebens nie einen Freund oder Mäzen auf Grund seines Benehmens verlor: dies spricht hoch für den persönlichen Respekt, der ihm entgegengebracht wurde, und natürlich auch über das große Ansehen seiner Musik. Stradellas Glück sollte jedoch nicht lange dauern, und am 25. Februar 1682 stieß ihm—aus nach wie vor unbekannten Gründen—ein Mörder dreimal einen Dolch in den Rücken und tötete ihn auf der Stelle. Er wurde in Santa Maria delle Vigne, einer der aristokratischsten Kirchen von Genua, begraben, eine enorme Anzahl von Kerzen wurden für ihn angezündet und 24 Messen für seine Seele gestiftet. Stradellas Musikhandsschriften fanden meist ihren Weg in die Bibliothek des Herzogs Francesco d’Este von Modena, die heute in der Biblioteca Estense Universitaria von Modena untergebracht ist, und in den Mauro Foà- und Renzo Giordano-Sammlungen in die Biblioteca Nazionale Universitaria von Turin. Händel besaß mehrere Handschriften Stradellas einschließlich einer Abschrift des Oratoriums San Giovanni Battista, und sowohl Charles Burney als auch Padre Martini priesen sein kompositorisches Geschick und zitierten Ausschnitte aus diesem Oratorium im Detail. Stradella selbst betrachtete San Giovanni Battista als sein bestes Werk bis dato. Die Brüderschaft der Kirche San Giovanni dei Fiorentini in Rom, die sich im Oratorio della Pietà traf, beschloss 1675 eine Serie von vierzehn Oratorien anzubieten, die von Januar bis April desselben Jahres aufgeführt werden sollten. Die Serie wurde dadurch angeregt, dass es ein Heiliges Jahr war, und die gewählten Komponisten gehörten zu den besten in Rom. Stradella erhielt den Auftrag, das sicherlich bedeutendste Libretto zu vertonen: über Johannes den Täufer, den Schutzheiligen von Florenz und der Florentiner, dem ihre Kirche in Rom geweiht war. Es wurde am 31. März 1675, am Palmsonntag, also einem der Haupttage im liturgischen Kalender, aufgeführt. Der Librettist war der 1651 als Sohn einer Adelsfamilie in Florenz gebürtige Ansaldo Ansaldi. Er hatte zunächst bei den Jesuiten in Florenz, dann an der Universität von Pisa studiert. Um sein Jurastudium fortzusetzen, ging er nach Rom, wo ihn auch eine glänzende Laufbahn in der Kirche erwartete. Sein literarisches Talent fand ebenfalls großes Ansehen, und er war Mitglied der Accademia Fiorentina und Arcadia. Ansaldi starb 1719 und wurde in San Giovanni dei Fiorentini begraben, was seine enge Verbindung mit der Brüderschaft und deren hohe Achtung für ihn ausdrückte. Stradella mit einer solch bemerkenswerten ekklesiastischen und literarischen Figur zu vereinen, macht klar, dass die Brüder auch den Komponisten hoch schätzte. Ansaldis Libretto gibt uns die übliche Geschichte von Johannes dem Täufer aus dem Neuen Testament (wie sie in Markus 6: 17–21 berichtet wird), die erzählt, wie er an den Hof von Herodes (Herode) geht, um ihn zu überzeugen, die Frau seines Bruders (Herodiade la Madre, oder Herodias) wegzuschicken, die er sich selbst zur Frau genommen hatte, und weltlichem Vergnügen und seinem wollüstigen Leben zu entsagen. Natürlich sind weder Herodias noch Herodiade la Figlia (auch als Salome bekannt) nicht bereit, ihr bequemes Leben aufzugeben und überreden Herode, Giovanni ins Gefängnis zu stecken. Aber als Herode in Dankbarkeit für ihren exotischen Tanz auf seinem Geburtstagsfest Salome verspricht, ihr jeden Wunsch zu erfüllen, wünscht sie sich auf Vorschlag ihrer Mutter Giovannis Kopf. Am Ende des Librettos zweifelt Herode, ob er das Richtige getan hatte, während Salome sich freut, dass er Giovanni umbrachte. Diesen Charakteren fügte Ansaldi einen Hofberater (Consigliere) hinzu, und Stradella besetzte das Oratorium mit zwei Sopranen (Salome und Herodias), einem Alt oder Countertenor (Giovanni), einem Tenor (Consigliere) und einem Bass (Herode); die Stimmen vereinen sich für die Rollen von Giovannis Jüngern und Herodes Höflingen. Die Namen der Sänger sind uns bekannt, und sie gehörten zu den besten, die Rom bieten konnte. Zur Begleitung der gesamten Serie von Oratorien standen zehn (nicht näher angegebene) Instrumentalisten zur Verfügung, denen für Stradellas Beitrag zehn weitere hinzugefügt wurden. Zu den Letzteren gehörten ein Cembalist, ein Lautenist, zwei Geiger, zwei Bratscher und zwei Kontrabassisten. So weit sich aus Dokumenten und aus der Partitur Stradellas ersehen lässt (sein Oratorium ist das einzige der Serie, das überlebte) wurden die Instrumente in ein Concertino und ein Concerto grosso eingeteilt. Das Concertino bestand wahrscheinlich aus zwei Violinen, Laute und einem der beiden Kontrabässe, während das Concerto grosso scheinbar sechs Violinen, vier erste Bratschen, zwei zweite Bratschen, vier Celli und einen Kontrabass enthielt. Das Cembalo konnte für beide Gruppen eingesetzt werden, obwohl es nur im Concertino gefragt ist, und, obwohl nicht spezifisch genannt, könnte durchaus auch eine Orgel verwendet worden sein. Stradella erreicht große Vielfalt und vermittelt Bewegung in diesem (traditionell nicht in Szene gesetzten) Oratorium, indem er die Instrumentation von Stück zu Stück ändert. Von den dreizehn Arien in San Giovanni Battista werden sechs nur von Continuo begleitet, sechs auch von anderen Instrumenten. Von diesen wird eine nur vom Concertino begleitet („Io per me non cangerei“), zwei nur vom Concerto grosso („Sorde dive“ und „Vaghe ninfe del giordano“), eine hat das Concerto grosso im ersten Teil und das Concertino im zweiten („Tuonerà tra mille turbini“), und eine Arie verwendet sowohl Concertino als auch Concerto grosso für ihre Begleitung („Soffin pur, rabbiosi fremiti“). Noch anders werden die Instrumente für die weiteren beiden Arien arrangiert: „Queste lagrime e sospiri“ ist die Aria, in der Salome Herode eindringlich drängt, Giovanni zu enthaupten, und hier bilden die Instrumente ein einziges Ensemble mit zwei Violinstimmen, einer Bratschenstimme und zwei separaten Continuo-Ensembles (von denen eines der Singstimme zugeteilt wird). In „Provi pur le mie vendette“ antwortet Herode dem Mädchen, und auch hier hat die Stimme ihre separate Generalbassgruppe, während die anderen Instrumente hier in zwei Violinistimmen, zwei Bratschenstimmen und Continuo aufgeteilt werden. Ansaldis Text ist äußerst dramatisch und ergreifend, und Stradella unterstützt das Fortschreiten der Handlung, ganz besonders indem er—zum Beispiel in „Queste lagrime“ und dem einleitenden Rezitativ „Deh, che più tardi a consolar“—den Horror der Forderung der Tochter für Giovannis Kopf verstärkt: seine Musik verrät all ihre Überredungskunst, wenn sie Herode schmeichelt; ihr Flehen um Mitleid, weil Giovanni zu sehen oder zu hören allein ihr Leiden verursacht, und zuletzt enthüllt die Musik ihr heftiges Bedürfnis, ihn hingerichtet zu sehen. In „Tuonerà tra mille turbini“ wird Herode zunächst als mächtiger König dargestellt, dessen Zorn über Giovanni ihn veranlasst, gegen ihn zu „donnern“ und ihn in eine dunkle Zelle zu verbannen. Aber nachdem er Giovanni enthaupten ließ, werden in dem Duett „Nel seren de’ miei/tuoi contenti“ mit Salome seine Schwäche, Unsicherheit und Furcht über seine Tat geschildert, die auch in dem unaufgelösten Akkord, mit dem das Oratorium schließt, angedeutet wird. Und das phantastische, virtuose Duett für die Tochter und Giovanni „Morirai! Uccidetelo/Uccidetemi pur!“ erlaubt ihm, seine Bereitschaft zu sterben, auszudrücken und ihr, sich gleichzeitig mit Genugtuung an seinem Schicksal zu weiden. San Giovanni Battista ist eine besonders „barocke“ Partitur, dynamisch und rhythmisch nachdrücklich, die den Sängern Phrasen schwieriger Koloraturen oder tief bewegendende Legatolinien abverlangt, und eine Partitur in Stradellas bester kontrapunktischer Manier, sei es für Stimmen und/oder Instrumente (wie etwa in der gut durchgearbeiteten einleitenden Sinfonia in drei kurzen Sätzen). Händel, Burney und Martini hatten allen Grund, das Werk zu bewundern. Alessandro Stradella fu assassinato a Genova il 25 febbraio 1682 all’età di quarantadue anni. Qualche anno più tardi, nel 1715, la prima storia della musica in francese, scritta da Pierre Bourdelot e suo nipote Pierre Bonnet-Bourdelot, conteneva un breve acconto dell’uccisione e degli eventi che portarono a essa. Anche se quasi tutta falsa, tale favola di un primo tentativo di assassinare il compositore, fallito perché i malviventi furono presi dalla bellezza della musica di Stradella sentita in concerto, insieme ad altri momenti eccitanti fabbricati dai due francesi, ha catturato l’immaginazione perfino di seri storici della musica i quali continuamente la ripeterono. Inoltre, era abbellita da scrittori in libretti d’opera e in romanzi per i successivi tre secoli. Fu solo nel 1994 che la prima documentata monografia sulla sua vita e musica è apparsa, e la «leggenda Stradella» fu finalmente messa da parte. Ora si sa che Stradella nacque nella città di Nepi (vicina a Viterbo) il 3 aprile 1639. La sua famiglia fu nobile e, anche senza titoli aristocratici, fra loro c’erano medici, avvocati ed ecclesiastici (uno diventò vescovo). E’ possibile che il ragazzo Alessandro studiasse musica a Bologna; quello che è certo è che nel 1653 divenne un paggetto nella famiglia ducale Lante e visse nel loro palazzo a Roma fino al 1661. Questi sarebbero stati anni di arricchimento intellettuale, di educazione musicale, e di contatti proficui con i molti nobili che frequentavano i Lante. La prima notizie di Stradella come compositore risale al 1667 quando gli fu commissionato di scrivere un oratorio (ora perduto) per la prestigiosa Arciconfraternita del Santissimo Crocifisso, la società di nobili che finanziarono l’Oratorio della Chiesa di San Marcello. In seguito e fino alla sua morte, Stradella mantenne la sua indipendenza di libero professionista componendo su commissione per famiglie come i Pamphili, i Colonna, gli Altieri e altri ancora. Egli fu sorprendentemente produttivo. Le sue più di trecento composizioni sono in tutti i generi del periodo: opere; oratori; cantate profane, sacre e morali; prologhi e intermezzi; mottetti e madrigali; musica di scena per un dramma parlato; sonate per uno o due strumenti solistici, come per organici di concertino–concerto grosso. La versatilità di Stradella fu accoppiata a una facilità e una rapidità nel comporre, evidenti nei suoi manoscritti autografi dove la sua penna sembra volare sulla pagina e le cancellazioni sono rare. Il suo stile musicale è distinto, caratterizzato da linee fluide, grande abilità in contrappunto, e armonia che era tonale ma che ogni tanto offre accordi non usuali per l’epoca e che colpiscono ancor oggi. Deve essere messo in chiaro che la musica vocale di Stradella è molto legata al testo, sia in forma che in stile. Questo è vero anche per i suoi recitativi dove, per poter mettere in rilievo certe parole e frasi, non sono infrequenti fioriture e ariosi, come non lo sono interventi strumentali occasionali e accompagnamenti strumentali continui. Stradella fu quindi fra i primi a comporre recitativo accompagnato. Egli compose anche il primo lavoro databile per concerto grosso (1674), come anche una delle prime opere comiche (1679). Compose scene di pazzia in due delle sue opere (1678 e 1679), ancora una novità a quel tempo, probabilmente scrivendo lui stesso il testo per due delle scene di pazzia del 1678. E la commedia in prosa per la quale scrisse arie e duetti sia seri che comici risulta essere un esemplare raro e completo di commedia dell’arte. Mentre una «leggenda Stradella» si sviluppò basata su racconti falsi ed esagerati della sua vita, i dettagli dell’esistenza vera di Stradella erano pur’essi eccitanti. Nel 1676, egli e un amico riuscirono a organizzare un matrimonio fra una donna detta essere «brutta e vecchia» e il nipote del Segretario di Stato del Vaticano, cardinale Cibo, ricevendo un’ingente somma di denaro dalla felice sposa. Naturalmente il cardinale non fu contento e, quando annullò il matrimonio e mise la donna in un convento, Stradella temette che la sua ira potesse essere rivolta anche verso di lui, e quindi all’età di trentotto anni saggiamente lasciò Roma per Venezia. Qui fu aiutato dal nobile Polo Michiel, già un suo mecenate, e cominciò a insegnare musica ad Agnese Van Uffele, una giovane donna protetta dall’aristocratico Alvise Contarini. Dopo solo pochi mesi, i due fuggirono a Torino, dove Stradella sperava che la corte avesse avuto bisogno dei suoi talenti. Benché Stradella disse più tardi che la fanciulla lo aveva implorato di portarla via, Contarini insistette che si sposassero. Quando tutto fu finalmente accordato, due bravi assunti da Contarini bastonarono il compositore così violentemente che quasi morì. Fortunatamente Stradella potè spostarsi a Genova nel dicembre 1677, questa volta da solo. Era accolto caldamente dal duca Giovanni Andrea Doria e da sua moglie Anna Pamphili, che fecero tutto il possibile per tenerlo in tale città. Infatti, un gruppo di nobili firmarono un contratto per dargli una casa, vitto, un servo e cento dobloni all’anno, per il quale l’unico suo obbligo fu di rimanere nella città per almeno due o tre anni. A Genova compose opere per il Teatro Falcone, musica per le feste private e per le chiese della nobiltà, come anche lavori richiesti da fuori. E’ da notare che, nonostante la sua vita un po’ erratica, Stradella non perdesse mai un amico o un mecenate a causa del suo comportamento: questo dice molto del rispetto tenuto per la sua persona, e senz’altro della grande stima per la sua musica. La buona fortuna di Stradella non era destinata a durare, purtroppo, e il 25 febbraio 1682—per motivi ancora non chiari—un assassino piantò un coltello nella sua schiena tre volte uccidendolo all’istante. Fu sepolto in una delle chiese più aristocratiche di Genova, Santa Maria delle Vigne, un enorme numero di candele erano accese per lui, e ventiquattro, messe sarebbero state dette per la sua anima. I manoscritti musicali di Stradella hanno trovato in gran parte la strada per la biblioteca del duca Francesco d’Este di Modena, ora tenuta nella Biblioteca Estense Universitaria di Modena, e per la Biblioteca Nazionale Universitaria di Torino nelle collezioni Mauro Foà e Renzo Giordano. Handel possedeva vari manoscritti di Stradella, inclusa una copia dell’oratorio San Giovanni Battista, e sia Charles Burney che padre Martini scrissero lodando le sue capacità compositive, citando in dettaglio brani di quest’oratorio. Stradella stessa considerava San Giovanni Battista il suo lavoro migliore fino a quella data. Nel 1675 la confraternita della Chiesa di San Giovanni dei Fiorentini a Roma, che si riuniva nell’Oratorio della Pietà, decise di offrire una serie di quattordici oratori da essere eseguiti fra il gennaio e l’aprile di quell’anno. La serie fu suggerita dal fatto che quello era un Anno Santo e i compositori selezionati furono fra i migliori di Roma. Stradella fu commissionato a mettere in musica quello che era certamente il più importante dei libretti, uno che riguardava San Giovanni Battista, santo patrono di Firenze e dei fiorentini e a cui la loro chiesa a Roma era dedicata. L’oratorio fu eseguito la domenica delle palme, il 31 marzo 1675, una posizione primaria nel calendario liturgico. L’autore del libretto era Ansaldo Ansaldi, nato a Firenze nel 1651 in una famiglia nobile. Aveva studiato prima con i Gesuiti a Firenze e poi all’Università di Pisa. Per continuare i suoi studi di giurisprudenza, si trasferì a Roma, dove ebbe un’illustra carriera ecclesiastica. Anche la sua abilità letteraria era riconosciuta ed egli fu fatto socio dell’Accademia Fiorentina e dell’Arcadia. Ansaldi morì nel 1719 e fu sepolto in San Giovanni dei Fiorentini, confermando la sua stretta connessione al confraternita e la loro stima per lui. Accoppiando Stradella con una figura ecclesiastica e letteraria di tale importanza mette in chiaro che i confratelli tenevano anche il compositore in grande riguardo. Il libretto di Ansaldi presenta la usuale storia del Nuovo Testamento (riportata in Marco 6: 17–21) di Giovanni Battista che va alla corte di Herode per provare a convincerlo di mandar via la moglie (Herodiade la madre) di suo fratello che egli ha preso per sé, e a rinunciare ai piaceri mondani e alla sua vita lasciva. Naturalmente Herodiade e sua figlia, Herodiade la Figlia (conosciuta anche come Salome) non sono disposte a por fine alla loro comoda vita e riescono a convincere Herode a incarcerare Giovanni. Però, quando Herode offre a Salome qualsiasi cosa che ella desideri, in gratitudine per aver danzato così esoticamente per lui alle festività del suo compleanno, sua madre le suggerisce di chiedere per la testa di Giovanni, cosa che fa. Alla fine del libretto Herode è in dubbio se abbia fatto bene, mentre Salome è contentissima che egli abbia fatto uccidere Giovanni. A questi personaggi Ansaldi aggiunse un consigliere della corte e Stradella compose l’oratorio per due soprani (Salome e Herodiade), un contralto o controtenore (Giovanni), un tenore (il Consigliere) e un basso (Herode). I nomi dei cantanti sono conosciuti ed erano fra i migliori di Roma. Per accompagnare l’intera serie di oratori c’erano dieci (non specificati) strumentisti, ai quali altri dieci ancora furono aggiunti per il contributo di Stradella. Fra quest’ultimi c’era un clavicembalista, un liutista, due violisti, due violinisti e due contrabbassisti. Da quanto si possa dedurre dai documenti e dalla partitura di Stradella (il suo è l’unico oratorio della serie che è sopravissuto), gli strumenti furono divisi in un concerto e un concerto grosso. Probabilmente il concertino fu composto da due violini, il liuto e forse uno dei contrabbassi, mentre il concerto grosso sembra di aver avuto sei violini, quattro viole prime, quattro viole seconde, quattro violoncelli e un contrabbasso. Il clavicembalo avrebbe potuto essere impiegato nel continuo di ambedue i gruppi, anche se è nominato solo nel concertino; e un organo, anche se non specificato, avrebbe potuto essere adoperato. Stradella ottiene gran varietà e senso di movimento nell’oratorio (tradizionalmente non allestito in scena) tramite il cambiare dell’organico da un brano all’altro. Delle tredici arie in San Giovanni Battista, sei sono accompagnate dal continuo solo e sei altre anche con strumenti. Di queste, una è accompagnata dal concertino solo («Io per me non cangerei»), due del concerto grosso solo («Sorde dive» e «Vaghe ninfe»), una adopera il concerto grosso durante la sua prima sezione e il concertino durante la sua seconda sezione («Tuonerà tra mille turbini»); e un’aria impiega il concertino e il concerto grosso insieme per il suo accompagnamento («Soffin pur rabbiosi fremiti»). Gli strumenti sono ancora diversamente organizzati per l’accompagnamento di due altre arie: «Queste lagrime e sospiri» è l’aria che Salome canta per incoraggiare Herode a decapitare Giovanni e qui gli strumenti costituiscono un solo insieme di due parti di violino, una parte di viola e due parti di continuo (una assegnata alla voce). In «Provi pur le mie vendette» Herode da la sua risposta alla ragazza e, ancora una volta, la voce ha un suo continuo, mentre gli altri strumenti sono divisi ora in due parti di violino, due parti di viola e una di basso continuo. Il testo di Ansaldi è molto drammatico e commovente e Stradella asseconda lo sviluppo della trama, rinforzando in maniera molto notevole—per esempio in «Queste lagrime» e il suo recitativo introduttivo «Deh, che più tardi a consolar»—l’orrore della richesta della Figlia per la testa di Giovanni; la musica rivela tutta la sua persuasione mentre adula Herode, il suo pregare per pietà dato che lei soffre solo nel vedere o nel sentire Giovanni e, finalmente, la musica mette in evidenza il suo violento bisogno di vederlo ucciso. In «Tuonerà tra mille turbini» Herode è prima presentato come un re potente, uno del quale l’ira verso Giovanni lo fa ‘tuonare’ e lo fa bandire a una buia cella. Ma dopo aver fatto decapitare Giovanni, la sua debolezza, incertezza e paura per quello che ha fatto sono messe in evidenza nel duetto con Salome «Nel seren de’ miei/tuoi contenti», e sono suggerite anche dall’accordo non risolto con il quale l’oratorio finisce. E il meraviglioso duetto virtuosistico per la Figlia e Giovanni, «Morirai! Uccidetelo/Uccidetemi pur!», rende possibile per lui di affermare la sua prontezza di morire e, simultaneamente, per lei di gioire con soddisfazione il suo terribile destino. San Giovanni Battista è una partitura particolarmente «barocca», viva, ritmicamente insistente, richiedendo ai cantanti di eseguire frasi di difficili fioriture o linee legate di intenso affetto, una partitura nella migliore maniera contrappuntistica di Stradella sia per voci e strumenti che per strumenti soli (come avviene nella ben sviluppata sinfonia d’apertura in tre brevi tempi). Handel, Burney e Martini avevano ragione ad ammirarlo. We Baroque enthusiasts are strange people! Although unquestionably the children of our own time, we are nonetheless fascinated by an age that might easily seem dead and buried. Performing and recording Stradella’s oratorio San Giovanni Battista was a thrilling experience and a great privilege for everyone involved, especially when we remember that so many of our heroes (not only Stradella, but Pasquini, Lonati, Colista and perhaps even Corelli) were involved in the first performance of this work. Exactly as would have happened in Stradella’s lifetime, our main band of musicians was joined by a number of ‘extras’ (in this case, the full complement of our youth orchestra). This made it possible to attain the original forces of twenty-eight players, which is absolutely essential for achieving the strong contrasts indicated in the score. And, again as then, we divided ourselves stereophonically into two ‘choirs’: the ‘concertino’ on the left and the ‘concerto grosso’ on the right, with the vocal soloists positioned in the middle. My first encounter with Stradella’s masterpiece happened some months before reading through it with the orchestra. What immediately struck me was its distinct operatic approach: the work we were dealing with was not so much an oratorio about the Baptist as a genuine Salome. This initial insight influenced all my subsequent choices, and I tried to think about the subject in terms of the theatre. In particular, I have attempted to highlight the subtleties of the narrative through suitable choices of colour in the continuo part (rarely specified by the composer), though always using instrumentations available in Stradella’s time. We have also taken the liberty of adding some short instrumental sinfonias by composers closely connected with the Roman oratorio environment (and hence probably present at the first performance) in order to mark out the different sections as real ‘scenes’. Hence, in this operatic ‘reconstruction’, the first movement of Lelio Colista’s Sinfonia a 3 in A minor for two violins and continuo, W-K30, acts as a prelude to the Sinfonia proper. By this means the work begins with the concertino alone and the overwhelming effect of the first tutti is greatly enhanced (a procedure inspired by the familiar introductions to other works by Monteverdi and Muffat). Carlo Ambrogio Lonati’s Sinfonia for two violins, cello and continuo in D major performs the function of connecting the first and second scenes. The improvisatory opening lends itself perfectly to connecting the pastoral first episode to the scene in the palace; the actual arrival at the palace is represented by the solemnity of the second section and the subsequent contrapuntal passage. The opening Adagio of Colista’s Sinfonia a 3, W-K32, then acts as an introduction to the second act and serves to express the pomp of the birthday celebrations. Later in the act the Largo of the same piece, with its tortured, chromatic saraband rhythm, fittingly describes the drama of the decapitation (an event not set by Stradella). Finally, we have placed the Allegro from the same Sinfonia at the close of the oratorio. This gives Salome the very last word, and it allows us to imagine her leaving the stage victoriously or dancing voluptuously. In all of these supplementary instrumental pieces the division into soli and tutti and the additional parts for the viola are my own (but as we all know, every concerto grosso can easily be turned into a trio sonata, and vice versa). Likewise I composed the almost madrigalian parts played by the cellos to portray Herode’s repentance; in this case I put myself in the shoes of those early musicians who could readily be called upon to improvise a suitable contrappunto alla mente. For dramaturgical reasons—and also to compensate for the lack of an aria for Salome’s mother—I assigned the aria ‘Volin pure lontano dal sen’ to Herodiade. The indication in the various manuscripts is somewhat ambiguous. As for the naming of the two female parts, I have adopted the system proposed by Massimiliano Del Vita (I due S. Giovanni Battista di Alessandro Stradella): the daughter is therefore referred to as ‘Salome’, the mother as ‘Herodiade’. Many of these decisions could, of course, be viewed as arbitrary, albeit inspired by historical truth. But there are times when our work as interpreters (and here we differ from scholars who prepare critical editions)—involving genuine and evolving acts of re-creation—makes us seem more like ‘forgers’ than ‘restorers’! But what can we do about that? After thirty years of enthusiastic research and reconstruction, I truly feel that we were back there in the seventeenth century, playing in their midst. Nous, les passionnés de baroque, sommes des gens bien étranges! Nous avons beau être sans conteste les enfants de notre temps, nous sommes fascinés par une époque qui pourrait volontiers sembler morte et enterrée. Interpréter et enregistrer San Giovanni Battista, l’oratorio de Stradella, fut une expérience passionnante et un rare privilège pour tous ceux qui y participèrent, surtout si l’on songe que nombre de nos héros (Stradella, mais aussi Pasquini, Lonati, Colista et peut-être même Corelli) furent impliqués dans la première exécution de cette œuvre. Tout comme au temps de Stradella, plusieurs «extras» se joignirent à notre groupe de musiciens (en l’occurrence, notre orchestre de jeunes au grand complet) pour pouvoir égaler les forces originelles—soit vingt-huit interprètes, un nombre absolument essentiel si l’on veut réaliser les forts contrastes indiqués dans la partition. De plus, et toujours comme au temps de Stradella, nous nous sommes scindés stéréophoniquement en deux «chœurs»: le «concertino» à gauche et le «concerto grosso» à droite avec, au centre, les solistes vocaux. Je découvris ce chef-d’œuvre de Stradella quelques mois avant de le parcourir avec l’orchestre et, d’emblée, je fus frappé par sa nette approche opératique: nous avions affaire non pas tant à un oratorio sur Jean-Baptiste qu’à une authentique Salomé. Cette première idée influença tous mes choix et j’essayai de penser le sujet en termes de théâtre. Surtout, j’ai tenté de rehausser les subtilités de la narration en choisissant bien la couleur de la partie de continuo (rarement spécifiée par le compositeur), mais en m’en tenant toujours aux instrumentations disponibles à l’époque de Stradella. Afin de faire ressortir les différentes sections comme de vraies «scènes», nous avons également pris la liberté d’ajouter de courtes sinfonias instrumentales écrites par des musiciens étroitement liés à la sphère de l’oratorio romain (et donc sûrement présents à la première de l’œuvre). Dans cette «reconstitution» opératique, le premier mouvement de la Sinfonia a 3 en la mineur pour deux violons et continuo, W-K30 de Lelio Colista fait ainsi office de prélude à la Sinfonia proprement dite. De cette façon, l’œuvre s’ouvre sur le concertino seul et l’irrésistible effet du premier tutti s’en trouve considérablement renforcé (un procédé inspiré des introductions bien connues d’autres œuvres de Monteverdi et de Muffat). La Sinfonia pour deux violons, violoncelle et continuo en ré majeur de Carlo Ambrogio Lonati sert à connecter les deux premières scènes. L’ouverture improvisée relie parfaitement le premier épisode pastoral à la scène dans le palais; quant à l’arrivée même dans le palais, elle est incarnée par la solennité de la seconde section et par le passage contrapuntique subséquent. L’Adagio initial de la Sinfonia a 3 W-K32 de Colista «introduit» le second acte et sert à rendre la pompe des festivités d’anniversaire. Plus loin dans l’acte, le Largo de la même pièce, avec son rythme de sarabande torturé, chromatique, dit bien le drame de la décapitation (un événement non mis en musique par Stradella). Pour terminer, nous avons ajouté l’Allegro de la même Sinfonia à la fin de l’oratorio, ce qui donne à Salomé le tout dernier mot et nous permet de l’imaginer quittant la scène, victorieuse, ou dans une danse voluptueuse. Dans tous ces ajouts instrumentaux, la division soli/tutti et les parties additionnelles pour l’alto sont de moi (mais, comme chacun sait, tout concerto grosso peut aisément être transformé en sonate en trio et vice versa). De même, j’ai composé les parties madrigalesques jouées par les violoncelles pour signifier la repentance d’Hérode; ce faisant, je me suis mis dans la peau de ces musiciens d’antan auxquels on recourait souvent pour improviser un contrappunto alla mente approprié. Des raisons dramaturgiques—mais aussi l’absence d’une aria pour la mère de Salomé, qu’il fallait compenser—m’ont poussé à attribuer l’aria «Volin pure lontano dal sen» à Hérodiade. L’indication présente dans les divers manuscrits est un rien ambiguë. Concernant la dénomination des rôles féminins, j’ai adopté le système proposé par Massimiliano Del Vita (I due S. Giovanni Battista di Alessandro Stradella): la fille est appelée «Salomé», la mère «Hérodiade». Bien qu’inspirées par la vérité historique, nombre de ces décisions pourraient naturellement sembler arbitraires. Mais il est des moments où notre travail d’interprètes (et nous différons en cela des érudits qui préparent des éditions critiques), avec ses authentiques et évolutifs actes de re-création, nous apparente plus à des «faussaires» qu’à des «restaurateurs»! Mais qu’y pouvons-nous? Après trente années de recherches passionnées et de reconstitution, j’ai vraiment l’impression d’avoir été en plein XVIIe siècle, jouant parmi les musiciens de l’époque! Wir Barockliebhaber sind seltsame Leute! Obwohl zweifellos Kinder unserer eigenen Zeit, fasziniert uns dennoch ein Zeitalter, über das schon längst Gras gewachsen sein könnte. Stradellas Oratorium San Giovanni Battista aufzuführen und aufzunehmen war eine aufregende Erfahrung und ein Privileg für alle Beteiligten, besonders, wenn wir bedenken, dass so viele unserer Helden (nicht nur Stradella, sondern auch Pasquini, Lonati, Colista und viellicht sogar Corelli) in der Uraufführung des Werks mitwirkten. Genau wie zu Stradellas Lebzeiten wurde unser Orchester durch eine Anzahl von „Extras“ verstärkt (in diesem Falle unser gesamtes Jugendorchester). Dadurch war es möglich, die Originalstärke von 28 Musikern zu erreichen, was absolut unerlässlich ist, um die starken Kontraste zu bewirken, die die Partitur verlangt. Und wie damals teilten wir uns in zwei Stereo-„Chöre“ mit dem „Concertino“ links und dem „Concerto grosso“ rechts und den Gesangssolisten in der Mitte. Ich kam mit Stradellas Meisterwerk einige Monate bevor ich es mit dem Orchester durchprobierte zum ersten Mal in Berührung. Was mir sofort auffiel war der opernhafte Ansatz: das Werk, mit dem wir uns befassten, war weniger ein Oratorium über den Täufer als eine echte Salome. Diese frühe Erkenntnis beeinflusste all meine weiteren Entscheidungen, und ich versuchte, das Sujet aus theatralischer Sicht zu betrachten. Im Besonderen habe ich mich bemüht, die Feinheiten der Handlung durch angemessene Klangfarbenwahl im Continuo zu unterstreichen (selten vom Komponisten genau angegeben), obwohl ich immer Instrumentierungen verwendete, die zu Stradellas Zeit möglich waren. Wir haben uns außerdem die Freiheit genommen, einige kurze Instrumentalssinfonien von Komponisten einzufügen, die eng mit der römischen Oratorienszene verbunden (und daher wahrscheinlich bei der Uraufführung anwesend) waren, um die verschiedenen Abschnitte als wirkliche „Szenen“ zu markieren. Daher dient in dieser opernhaften „Rekonstruktion“ der erste Satz von Lelio Colistas Sinfonia a 3 in a-Moll für zwei Violinen und Continuo, W-K30 als Vorspiel zur eigentlichen Sinfonia. Das Werk beginnt also mit dem Concertino allein, und der überwältigende Effekt des ersten Tutti wird dadurch enorm verstärkt (ein Prozess, der durch die bekannten Einleitungen zu Werken von Monteverdi und Muffat inspiriert wurde). Carlo Ambrogio Lonatis Sinfonia für zwei Violinen, Cello und Continuo in D-Dur leitet von der ersten zur zweiten Szene über. Ihr improvisatorischer Anfang eignet sich ausgezeichnet dazu, die pastorale erste Episode mit der Szene im Palast zu verknüpfen: die Ankunft im Palast wird durch die Feierlichkeit des zweiten Abschnitts und die folgende kontrapunktische Passage dargestelltt. Das einleitende Adagio aus Colistas Sinfonia a 3, W-K32 ist die Einleitung zum zweiten Akt und soll den Prunk der Geburtstagsfeierlichkeiten ausdrücken. Später im Akt beschreibt das Largo desselben Werks mit seinem gequälten chromatischen Sarabandenrhythmus angemessen das Drama der Enthauptung (ein Ereignis, das nicht von Stradella vertont wurde). Zuletzt haben wir das Allegro aus derselben Sinfonia an das Ende des Oratoriums gestellt. Dies gibt Salome das letzte Wort und wir können uns vorzustellen, wie sie entweder triumphal oder wollüstig tanzend die Bühne verlässt. In all diesen ergänzenden Instrumentalstücken stammen die Teilung in Soli und Tutti und die zusätzlichen Bratschenstimmen von mir (aber wie wir wissen kann jedes Concerto grosso leicht in eine Triosonate verwandelt werden und umgekehrt). Gleichermaßen komponierte ich die nahezu madrigalistischen Cellostimmen, die Herodes’ Reue ausdrücken sollen; in diesem Falle trat ich in die Fußstapfen jener frühen Musiker, die leicht einen angemessenen contrappunto alla mente improvisieren konnten. Aus dramaturgischen Gründen—und um für des Fehlen einer Arie für Salomes Mutter zu kompensieren—gab ich Herodias die Arie „Volin pure lontano dal sen“. Die Zuordnung in den verschiedenen Handschriften ist eher zweideutig. Für die Namensgebung der beiden Frauenrollen bin ich dem System gefolgt, das Massimiliano Del Vita (I due S. Giovanni Battista di Alessandro Stradella) vorschlug: die Tochter wird als „Salome“ bezeichnet, die Mutter als „Herodias“. Viele dieser Entscheidungen, wiewohl von historischer Wirklichkeit inspiriert, lassen sich natürlich als willkürlich betrachten. Aber manchmal lässt unsere Arbeit als Interpreten (und hier unterscheiden wir uns von Wissenschaftlern, die kritische Ausgaben erstellen)—einschließlich echter, sich allmählich herausbildender Neuschaffung—uns mehr als „Fälscher“ und weniger als „Restauratoren“ erscheinen! Aber was können wir da tun? Nach dreißig Jahren begeisterter Forschung und Rekonstruktion fühle ich mich wirklich, als ob wir ins 17. Jahrhundert versetzt wurden und inmitten seiner Musiker spielen! Strana gente noi appassionati di barocco! Pur essendo totalmente figli del nostro tempo vagheggiamo un’epoca oramai lontana, tramontata si, ma a quanto pare non per sempre. Sapendo che molti dei nostri idoli, Pasquini, Stradella, Lonati, Colista, forse addirittura Corelli, avevano preso parte alla prima esecuzione, noi tutti dell’Academia abbiamo vissuto come un grande privilegio il periodo della registrazione e dei concerti che l’hanno preceduta. Proprio come all’epoca si sono uniti a noi dei musici extra (la nostra orchestra giovanile al completo) per raggiungere l’organico originale di 28 esecutori necessarissimo per realizzare i grandi contrasti contenuti nella partitura; e come allora ci siamo divisi stereofonicamente in due «chori», il «concertino» a sinistra, il «concerto grosso» a destra, collocando i solisti vocali al centro. Il mio personale incontro con il capolavoro stradelliano è avvenuto alcuni mesi prima delle prime letture d’orchestra. Sin dall’inizio mi è parso evidente il taglio teatrale dell’oratorio: mi trovavo di fronte ad una «Salome» in carne ed ossa. Questa prima intuizione ha influenzato tutte le mie scelte successive. Ho cercato di ragionare drammaturgicamente cercando di sottolineare ogni sottigliezza della narrazione con un’adeguata scelta di colori nel basso continuo (purtroppo rarissimamente specificato dal compositore) sempre usando strumentazioni in uso all’epoca. Mi sono anche permesso di aggiungere, quasi a delineare una divisione in grandi scene, delle brevi sinfonie strumentali di autori legati all’ambiente oratoriale romano (e probabilmente presenti alla prima esecuzione), proprio come avrei fatto per una versione scenica. A questo scopo mi parvero perfette alcune pagine di Colista e Lonati. Così, nella mia ideale ricostruzione di un’opera forse mai realizzata scenicamente all’epoca, il primo movimento della Sinfonia in la minore a 2 violini e basso a 3, W-K30 di Lelio Colista funge da preludio alla Sinfonia vera e propria, permettendoci di iniziare l’ascolto con il solo concertino e di aumentare l’effetto dirompente del primo tutti (ho preso ispirazione per questo procedimento dalle ben note prefazioni di Monteverdi e Muffat alle loro opere). La Sinfonia a 2 violini, violoncello e basso in re maggiore di Carlo Ambrogio Lonati svolge la funzione di ponte tra la prima e la seconda scena. L’inizio di tipo improvvisativo (se non avessi trovato questo pezzo avrei chiesto al primo violino di inventare all’impronta un «ponte») si presta perfettamente a collegare la scena «pastorale» con quella «a palazzo»; l’arrivo alla reggia è rappresentato a sua volta dalla seconda sezione dai modi solenni e dalla successiva in stile contrappuntistico. L’Adagio iniziale della Sinfonia a 3, W-K32 di Lelio Colista funge da introduzione all’atto secondo esprimendo la pomposità della festa di compleanno a palazzo. Il Largo della stessa Sinfonia, con il suo torturato ritmo di sarabanda cromatica, ben descrive il dramma della decapitazione (non espresso in musica dallo Stradella). Infine ho posto l’Allegro della medesima Sinfonia a conclusione dell’oratorio, cedendo idealmente l’ultima parola a Salome immaginandola mentre danzando voluttuosamente lascia vittoriosa il palcoscenico. In tutti questi interventi strumentali la divisione in soli e tutti e la parte aggiunta di viola sono mie (come sappiamo ogni concerto grosso può essere trasformato in una sonata a tre e viceversa). Allo stesso modo ho composto le linee quasi madrigalesche eseguite dai violoncelli con l’intento di dipingere il pentimento di Herode, immaginando antichi esecutori in grado di improvvisare con facilità un contrappunto alla mente. Per ragioni drammaturgiche e per ovviare all’assenza di arie per Herodiade (madre) ho deciso di attribuirle l’aria «Volin pure lontano dal sen» (nei vari manoscritti l’indicazione non è inequivocabile). Allo stesso modo, seguendo il sistema scelto da Massimiliano Del Vita nella sua tesi di laurea su I due S. Giovanni Battista di Alessandro Stradella, ho scelto il nome «Salome» per indicare la figlia, e «Herodiade» per la madre. Mi rendo conto perfettamente che si tratta in molti casi di interventi arbitrari, seppur ispirati alla realtà storica. Il nostro lavoro di interpreti, a differenza degli stesori di edizioni critiche, ci accomuna talvolta più ai falsari cha ai restauratori… ma che volete fare, dopo trent’anni di appassionato lavoro di ricerca e di restituzione sembra davvero di esserci stati, nel seicento, proprio in mezzo a loro!